NYC public housing residents call for a cancellation of rent following Hurricane Sandy and loss of basic services. Following the devastating wrath of Hurricane Sandy, hundreds of thousands were left without basic services like power, heat and running water. And even though the New York City Housing Authority (NYCHA) didn’t respond to complaints and pleas for help for an entire week, and many public housing residents remain without basic services, residents are still expected to pay rent. Finally, on November 19, three weeks after the storm, the NYCHA held a hearing on the matter in Red Hook. Angry residents asked the board about the lack of a swift response, and dozens of others left the hearing, instead opting to attend a community assembly organized by participants of Occupy Red Hook and Occupy Sandy down the street. “No services, no rent,” another affirmed. “When Obama won, I didn’t hear any jubilation–because the projects were dark,” noted another. 1. Immediate demand: Cancel 2 months’ rent for both November and December (speed up and extend NYCHA’s promised rent credit for January). 2. From a list of Long-term demands: Hold moratorium on evictions. Increase and ensure sufficient federal disaster relief funding to NYCHA. Replace NYCHA board with a community-led board. Employ NYCHA residents for intensive building repairs instead of outsourcing jobs. Implement long-term alternative power and weather-prepared solutions. Enact general accountability and transparency to residents. 3. 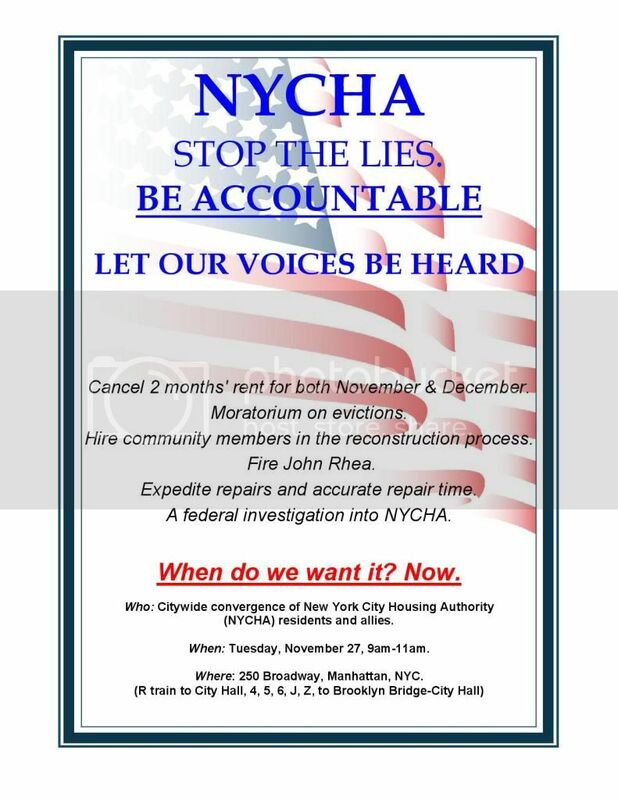 Next step: pressure NYCHA board meeting on December 5, 10 am, same location. Occupy Wall Street advertised the protest on its website, and added that NYCHA has been deeply defunded under Governor Cuomo’s tenure. “Occupy Sandy and its many partners on the ground have filled the void through mutual aid, but we are not a band-aid movement and we are not here as a proxy for the State. This is the first instance of self-organization in the aftermath of Hurricane Sandy that is calling out one of the roots of the problem—austerity measures and the defunding of public institutions. The foundations of the so-called “austerity crisis” are in the bank vaults lining Wall Street. The root cause of the rising sea levels that led to Hurricane Sandy, can be found in Wall Street’s bankrolling of fossil fuel companies and climate change,” the group states. Tenants who lived without heat, hot water, elevators and power for as long as three weeks wanted a rent discount right away, worried that they would fall behind in December’s rent because of extra expenses incurred after Sandy. Last week, the Legal Aid Society and the New York Legal Assistance Group pressed NYCHA for the eviction moratorium for affected tenants. On Friday, NYCHA caved, agreeing not to pursue evictions of or default judgments against Sandy-affected tenants who don’t pay or are late with next month’s rent. The break will remain in place until Jan. 1—the date the rent credit kicks in. The agency also agreed to postpone Housing Court cases that predate Sandy for tenants hurt by the hurricane. Rhea and the Housing Authority have also been criticized for putting a gag order on workers to prevent them from giving information to elected officials in the chaotic days following Sandy. Four days after Sandy knocked out services, Cecil House, the general manager, sent a memo to the agency’s 11,500 staffers ordering them to clam up if a public official wanted to know about a particular development. For more on Occupy Sandy's work in the wake of the storm, check out Allison Kilkenny's coverage here.